1 Wendy watched Tim walking down the street. He was wearing his Cub Scout uniform. "Where are you going, Tim?" yelled Wendy. 2 "I am going to put flags on graves at the cemetery," answered Tim. 3 Wendy wanted to know more. But Tim was already gone. 4 Wendy went to Tim and Tess's house. Maybe Tess would explain what Tim was doing. 5 Wendy knocked on the door. Tess opened the door and asked her in. "I just saw Tim walking down the street," said Wendy. "He said he was going to the cemetery." 6 "Yes," said Tess. 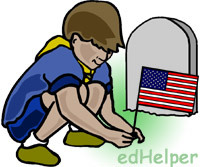 "His scout troop is putting flags on the graves of people who were in the military." 7 "Why are they doing that?" asked Wendy. 8 "Mr. Michaels is Tim's scout master," answered Tess. "He told them all about it. Today is Memorial Day." 9 "Yes," said Wendy. "I know that. It is a holiday. We get out of school."